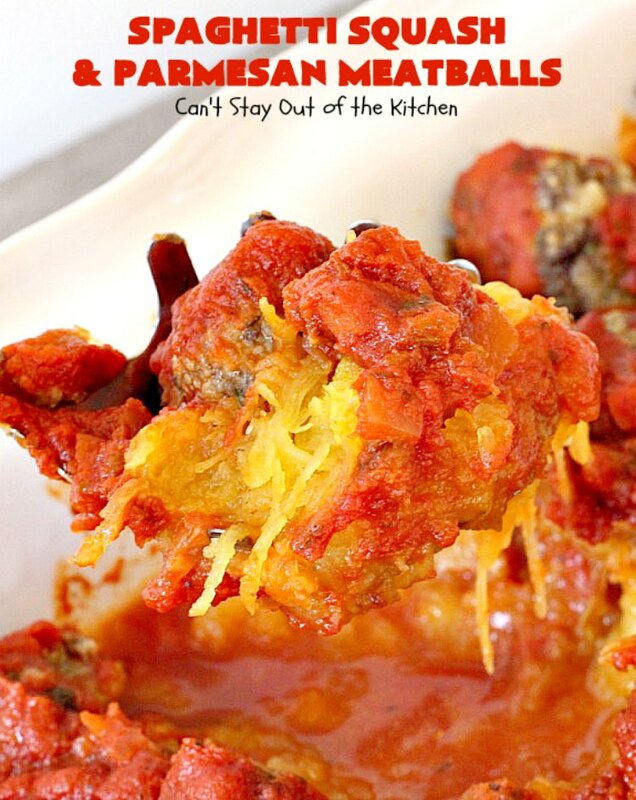 Oh my goodness, Spaghetti Squash and Parmesan Meatballs is the perfect answer to post-holiday weight gain! Truly, this entree is fantastic. Instead of using regular pasta, this recipe uses spaghetti squash. I made a homemade beef and parmesan-based meatball that was superb. But if you want to save time, you can also substitute a batch of pre-made chicken or turkey meatballs that will also work. 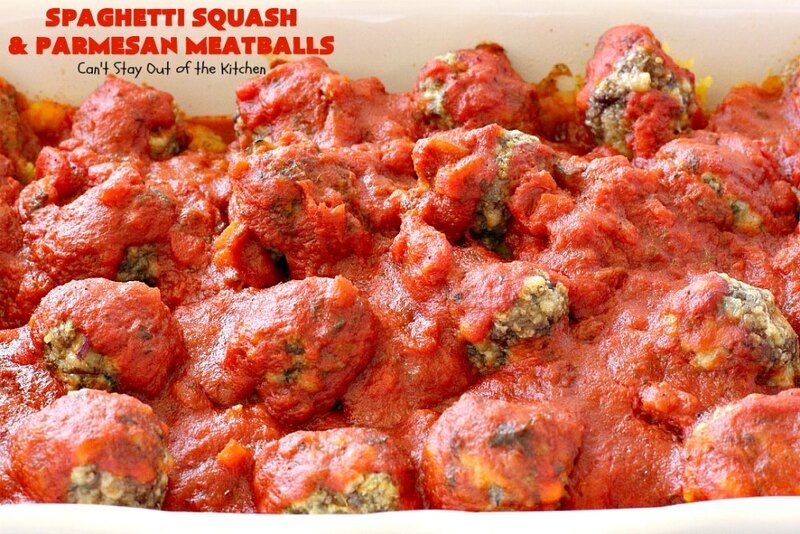 Add a jar of spaghetti sauce and you’re good to go! Back in November one of our dearest friends passed away the day after Thanksgiving. She had ALS so the last few months were extremely difficult. John and I used to go out with her and her husband to movies on occasion when we lived in Waxahachie. The theater was only about five to ten minutes away from our house so we would have them over for dinner and then all go out and enjoy a movie together. We will miss those times. It just goes to show that you must treasure every moment you have with family and friends. It’s a gentle reminder not to take for granted that you will have the health or finances to enjoy each other indefinitely. I organized a funeral meal for the family. One of the gals I called on to bring food made this amazing dish. We absolutely loved it. When I asked Cyndie what she did, I took notes on my phone to see if I could replicate her “recipe.” Cyndie used H-E-B’s pre-made chicken meatballs because she’s always trying to find a way to cut calories and fat from her husband’s diet. 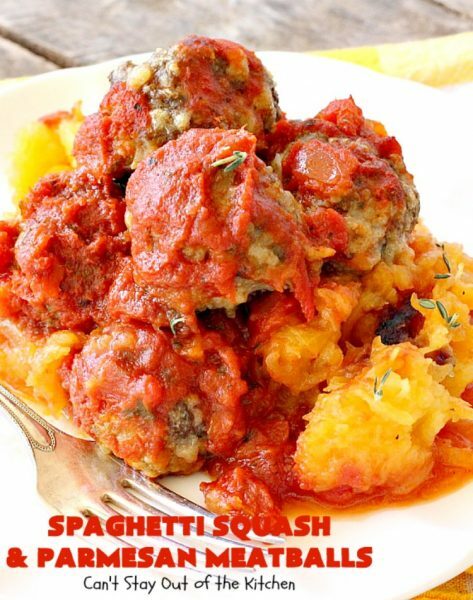 🙂 She has also made this before with her own homemade tomato sauce using lots of different kinds of tomatoes. She said that turned out really delicious. I decided to make up my own gluten free meatballs with lean ground beef, gluten free bread crumbs and an Italian blend of cheese. I added some seasonings, onion and eggs. 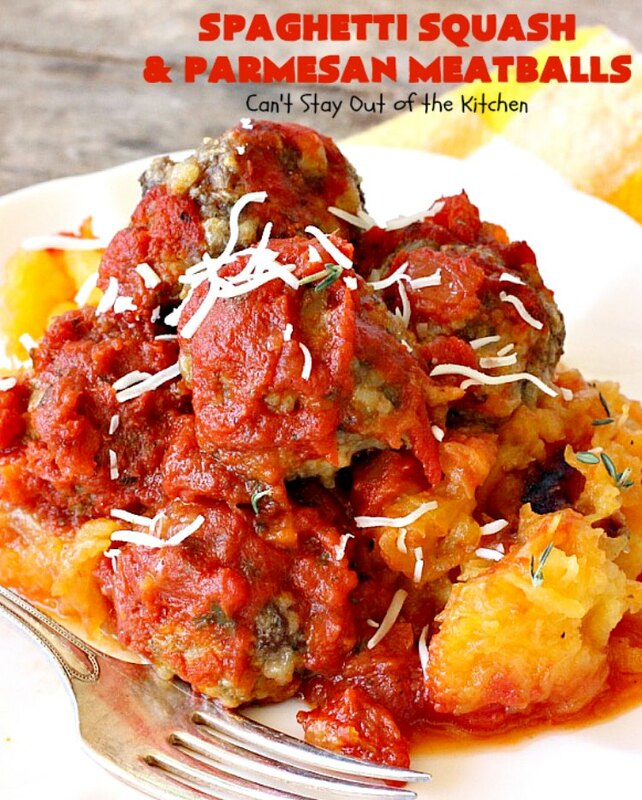 I chose to bake my meatballs in the oven rather than adding additional fat by frying. 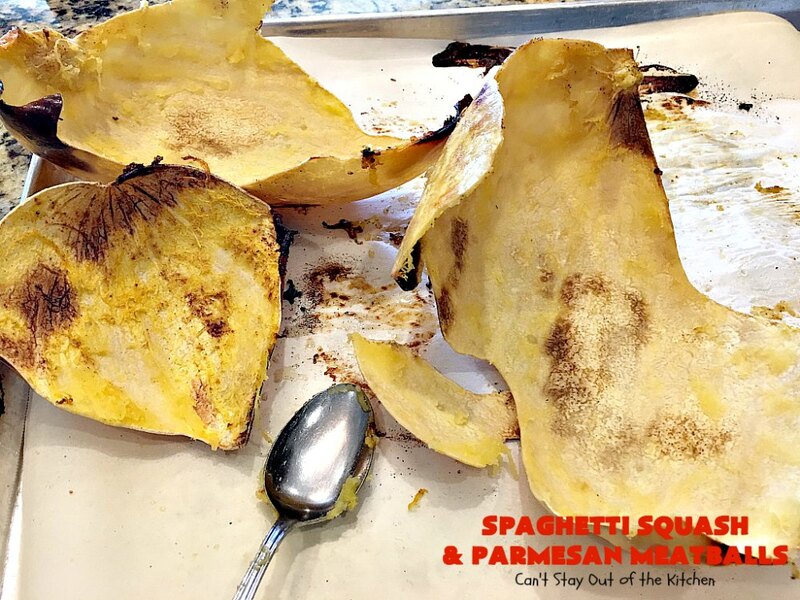 One of Cyndie’s secret ingredients is to add a little paprika or cayenne pepper to the squash while baking and then again to the sauce to provide a very gentle kick to the recipe. I chose to use both. I thought it turned out wonderfully. I took this dish along with a simple salad and my Fresh Cherry Coffeecake to a friend who was recovering from knee surgery. There was enough for them to have leftovers which they froze for a rainy day. Spaghetti Squash and Parmesan Meatballs is much healthier and lower calorie than eating a regular pasta dish. It also tastes fantastic! 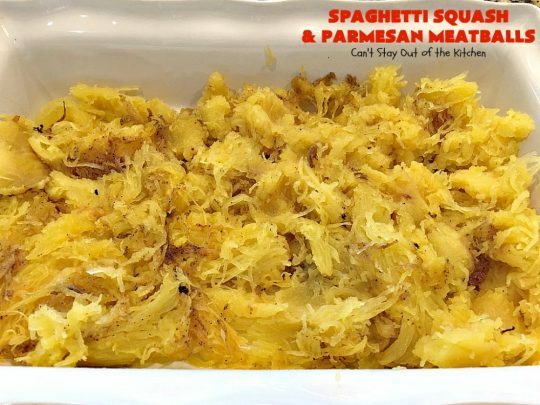 While I chose to make the recipe gluten free by using gluten free bread crumbs, any kind of bread crumbs including Panko will work with this dish. If you’re looking for a delightful way to ring in the New Year, I can’t recommend this recipe highly enough. 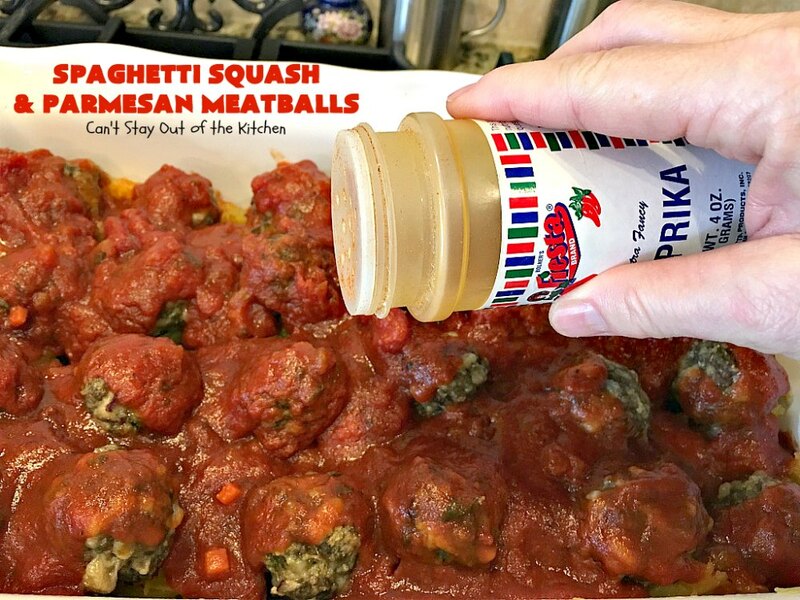 Every bite will have you drooling….especially if you kick it up a notch by adding a sprinkle of paprika and cayenne pepper. Yes, it’s absolutely delicious and a main dish you’ll love digging into. 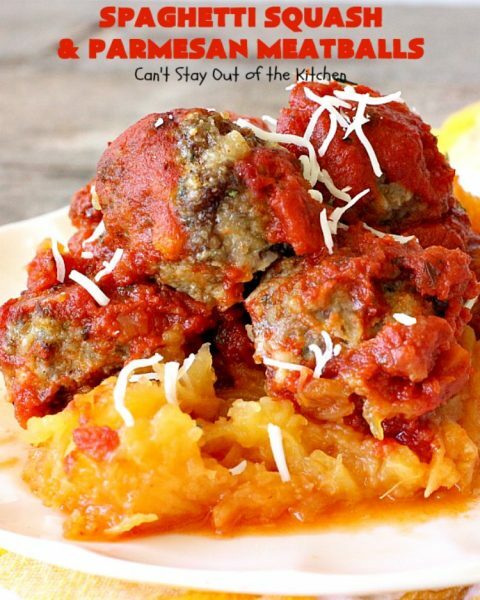 Spaghetti Squash and Parmesan Meatballs is a delicious entree that’s healthy and low calorie. It’s a great alternative to all the heavy fare of the holidays. The paprika and cayenne pepper added just enough kick to make this interesting, but not so much that it overwhelmed the dish. This tasty entree is wonderful garnished with a bit of fresh thyme. 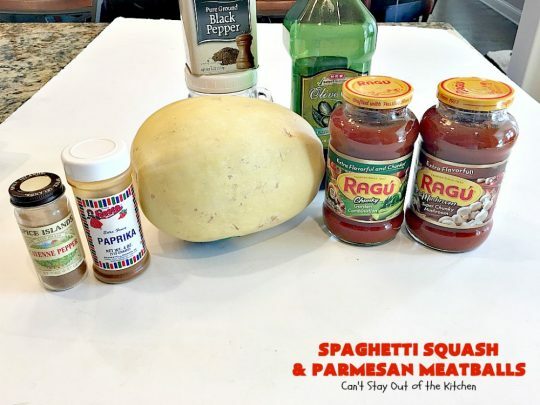 I used these ingredients for the main recipe. 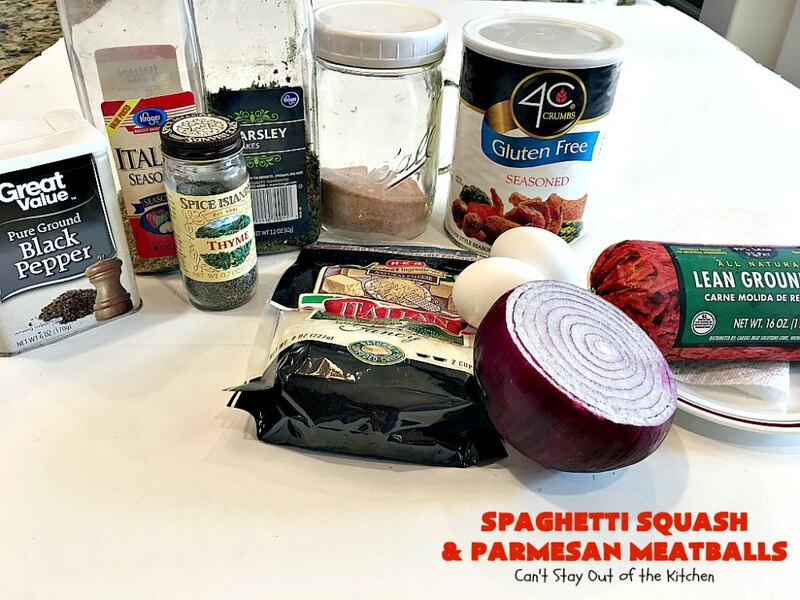 I used only one jar of spaghetti sauce. The mason jar under the pepper is pink Himalayan sea salt. Cut squash in half. Remove seeds. Place parchment paper on a large cookie sheet. 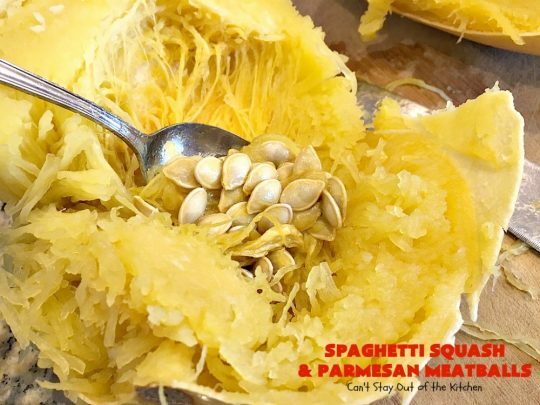 Drizzle each squash half with olive oil. Season with salt, pepper, paprika and cayenne pepper. Turn squash over and bake at 400 degrees for about 45 minutes until done. 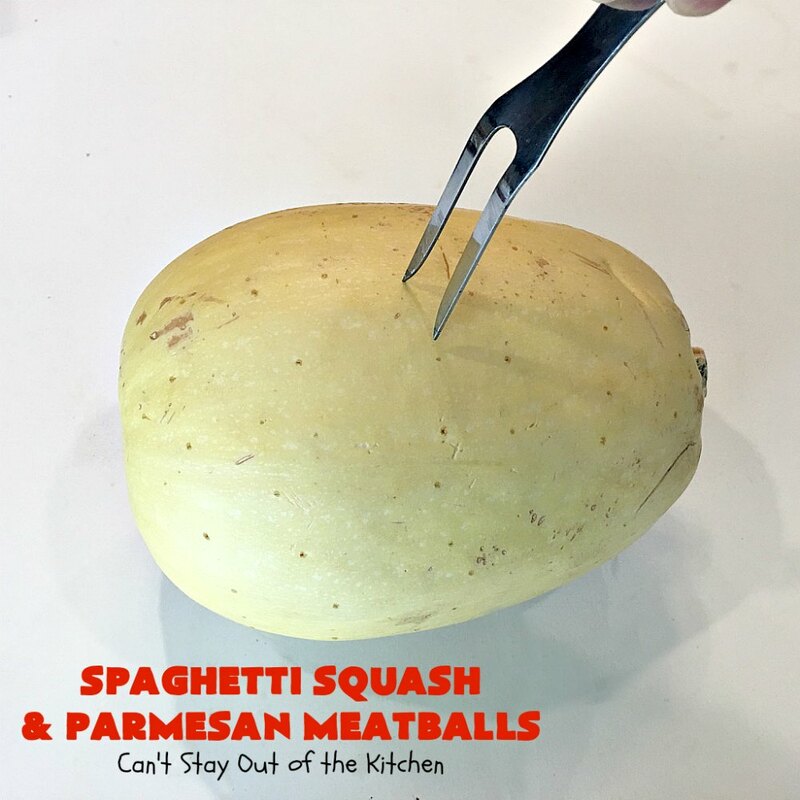 Remove squash from shell with a fork. 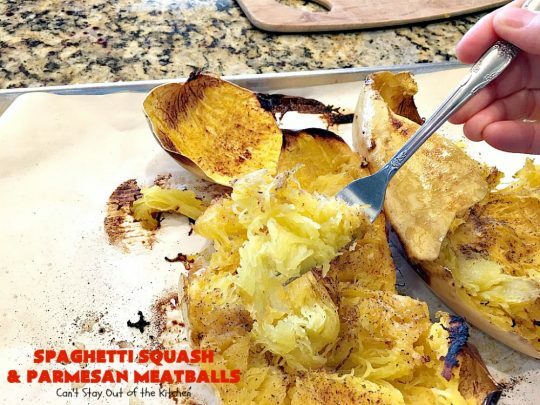 Clean out any remaining squash with a spoon. 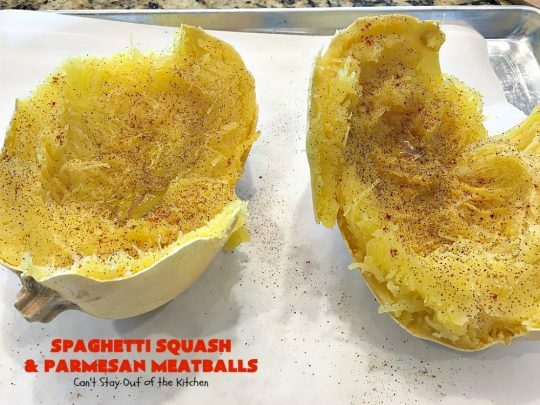 You can see that you get just about every bit of the squash out of the shell. It actually comes out very easily. I used these ingredients for the meatballs. Place beef in a large mixing bowl. 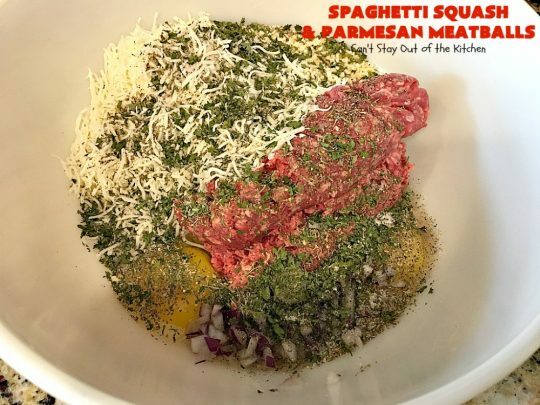 Add remaining ingredients. Mix ingredients with your hands until the ingredients are thoroughly mixed. 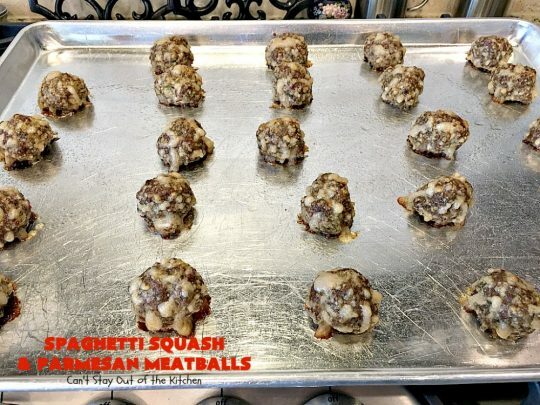 Roll meat into balls and place on a greased cookie sheet. 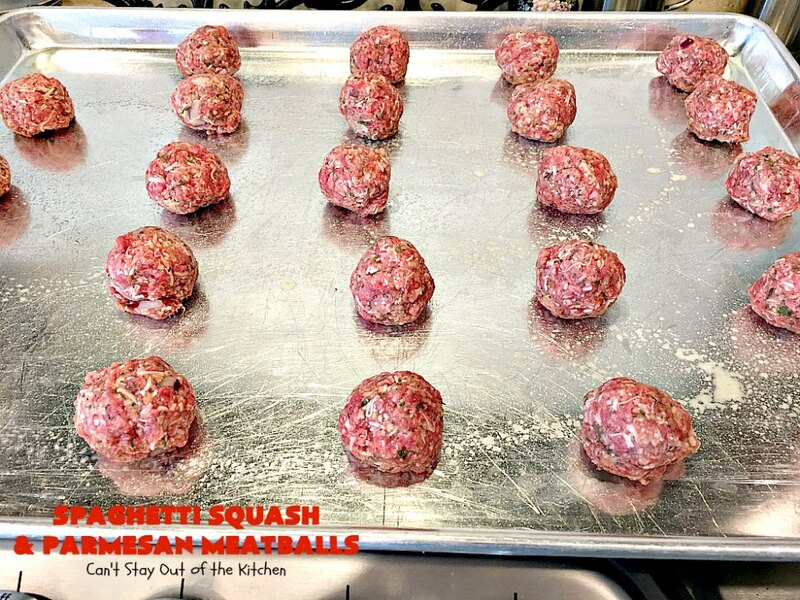 Bake meatballs at 350 degrees for about 30-40 minutes or until done. Spray a 9×13″ glass baking dish with olive oil cooking spray. Add spaghetti squash and place in prepared dish. Place cooked meatballs on top of the squash. 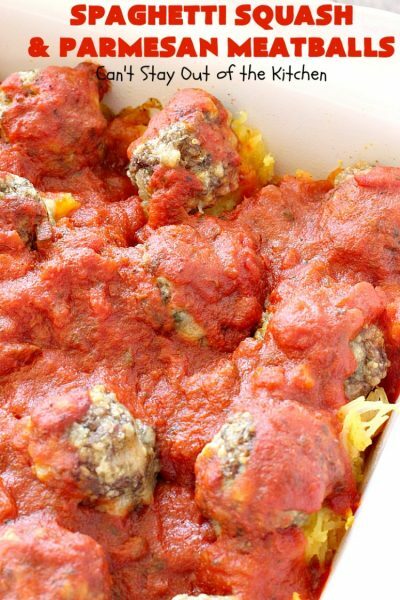 Drizzle a jar of your favorite spaghetti sauce over top of the meatballs and spaghetti squash. Sprinkle casserole lightly with paprika and cayenne pepper. Bake at 350 about 10-15 minutes until heated through. Garnish with parmesan cheese shavings, if desired. 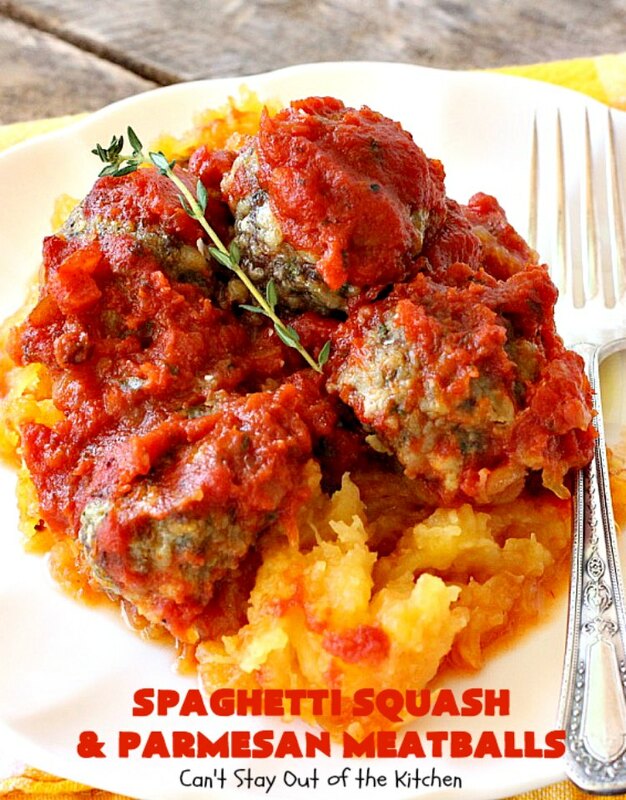 This healthy, low calorie meal can be made even more quickly if you used pre-made meatballs! This is also good garnished with fresh thyme. This fabulous spaghetti squash entree uses homemade parmesan meatballs and spaghetti sauce. 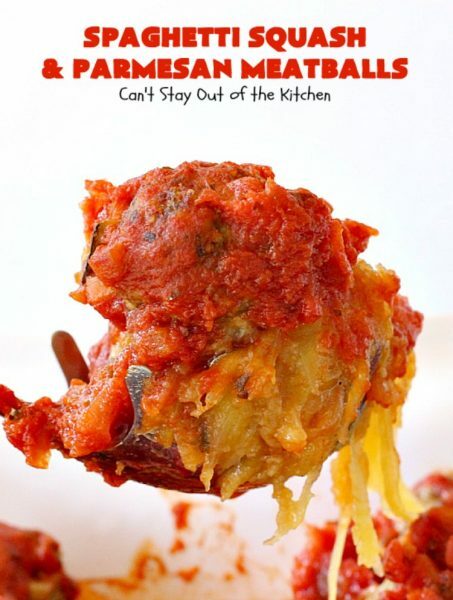 It's healthy, low calorie, gluten free and has just enough kick from paprika and cayenne pepper to make it mouthwatering. Prick spaghetti squash all over with a fork. Place in microwave on 100% power for about 12-13 minutes. 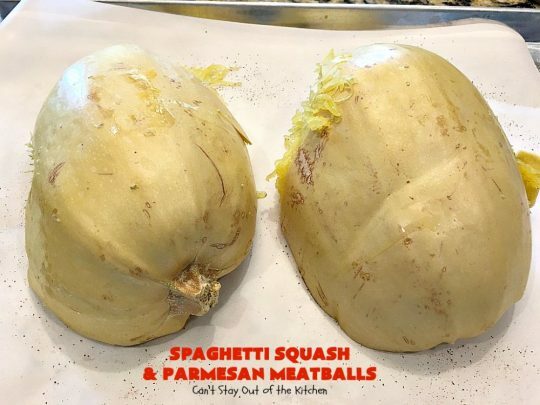 Remove from microwave and cut in half lengthwise. Drizzle olive oil over top of squash halves. Sprinkle each squash half generously with salt, pepper. Add just a few shakes of cayenne pepper and paprika. Place cut-side down on a parchment paper-lined cookie sheet. Bake at 400° about 45 minutes until cooked through. 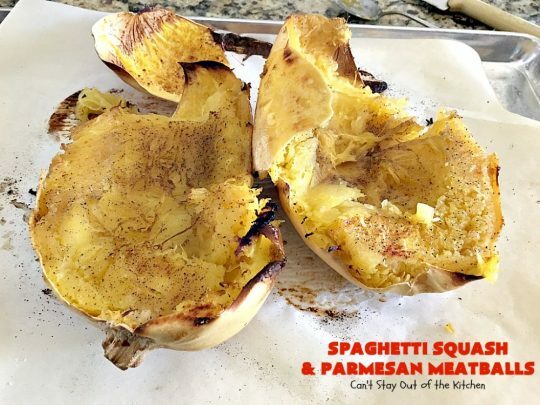 Remove from oven and remove squash from shell with a fork. Place in the bottom of a greased 9x13” baking dish. Spoon spaghetti sauce over top. Sprinkle casserole very lightly with paprika and cayenne pepper to give it just a little kick. Heat through at 350° for about 10-15 minutes. Combine ingredients in a large mixing bowl with your hands until thoroughly mixed. 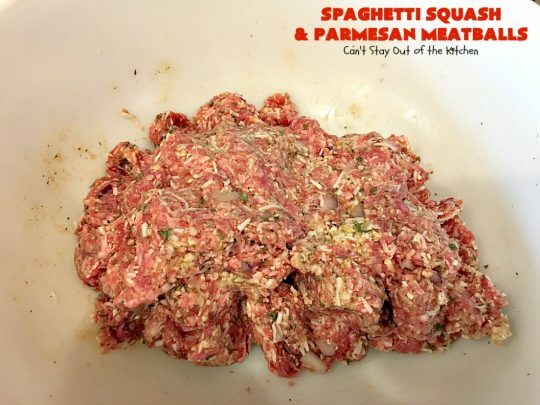 Roll beef mixture into balls. Place on a lightly sprayed cookie sheet and bake at 350° about 30-40 minutes or until meatballs are thoroughly cooked. NOTE: Cyndie used a chicken-parmesan meatball from HEB. The meatballs were gluten free and the parmesan cheese was vegan. 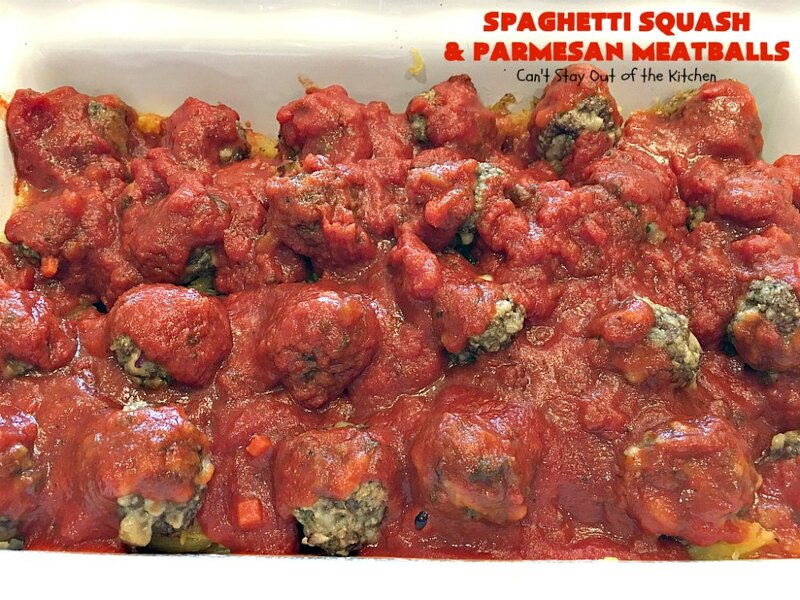 She has also made this with her own homemade marinara sauce. NOTE: If you cook the squash too long it will explode in the microwave. So it won’t be too soft, but hopefully soft enough that you can cut it with a knife and remove the seeds and pulp. This is a delicious casserole to bake for company. 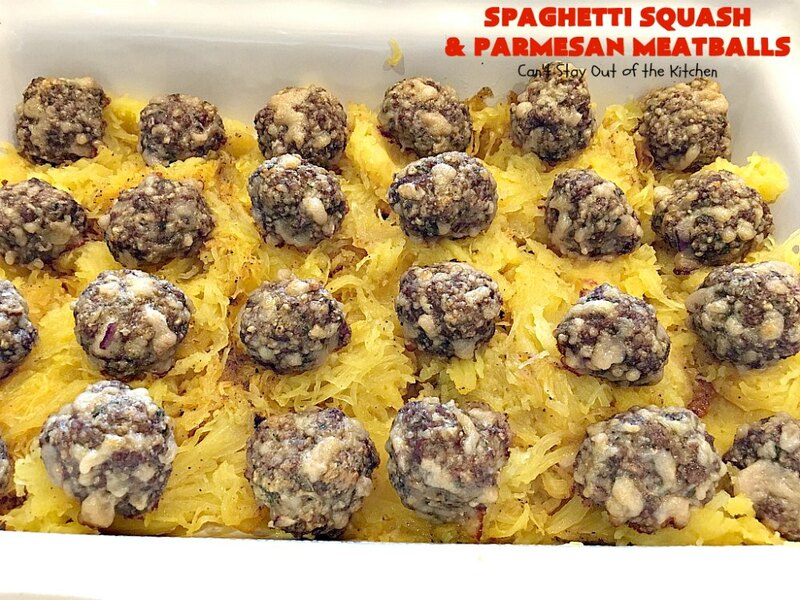 Doesn’t Spaghetti Squash and Parmesan Meatballs look terrific? 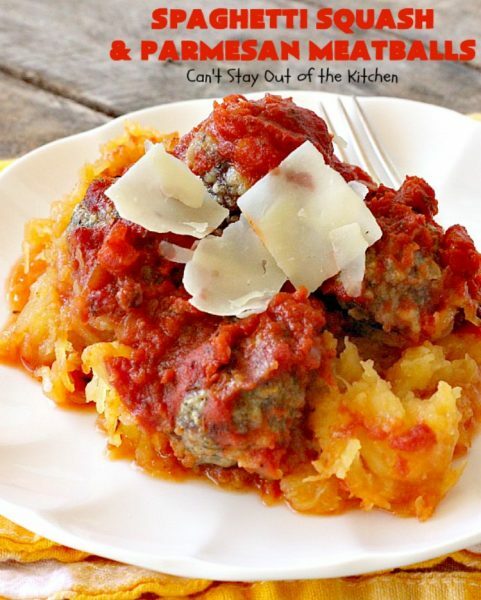 Spaghetti Squash and Parmesan Meatballs is a great entree to fix when you want a delicious meal but lighter fare.